﻿ PORTWELL ANNOUNCES PICO-6260 PICO-ITX FORM FACTOR EMBEDDED SYSTEM BOARD UTILIZING LATEST GENERATION INTEL® ATOM® APOLLO LAKE SOC- Portwell, Inc.
Portwell, Inc., (www.portwell.com.tw) a world-leading innovator in the Industrial PC (IPC) market and an Associate member of the Intel® Internet of Things Solutions Alliance, today announces the release of the PICO-6260 (100mm x 72mm) Pico-ITX embedded system board based on the Intel® Atom® processor E3900 series and Intel® Celeron® processor N3350, formerly codenamed Apollo Lake. The Intel® Atom® processor E3900 series and Intel® Celeron® processor N3350 integrates the Intel® Gen 9 3D graphics engine with up to 12 EUs (Execution Units) that improves performance and supports 4K codec encoding/decoding. It also supports one dual-channel 24bit LVDS connection and one HDMI on rear I/O with resolution up to 3840x2160. The 204-pin non-ECC SO-DIMM provides maximum memory support for up to 8GB of DDR3L. In addition, Portwell’s PICO-6260 features a total of two COM ports, three USB ports (1x USB 3.0 on rear I/O, 2x USB 2.0 on board header) and one gigabit Ethernet. 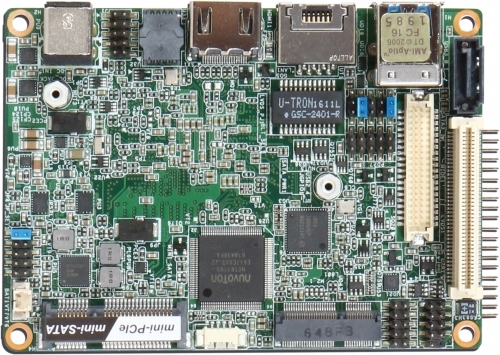 The PICO-6260 represents the latest state-of-the-art innovation that results from the years of experience Portwell has gained as a manufacturer of high-quality computer boards. The Portwell PICO-6260 is a palm-sized fan-less Pico-ITX embedded system board built with the Intel® Atom® processor E3900 series and Intel® Celeron® processor N3350. Not only does it operate with thermal design power (TDP) under 6W for fan-less applications, but it also supports an operation temperature range from 0°C to 60°C and supports 12V power DC input applications. The PICO-6260, designed with the Intel® Atom® processor E3900 series and Intel® Celeron® processor N3350, features one DDR3L 1333/1600/1866 MHz SO-DIMM socket equipped with up to 8GB DDR3L memory. It also integrates Intel® graphics supporting DirectX 12, OpenGL 4.2, OpenCL 2.0 plus high-performance, flexible hardware decoding to decode multiple high-resolution 4K videos in parallel. In addition, it supports up to 3840x2160 pixels with HDMI port, and dual-channel LVDS up to 1920x1200 pixels, and is designed with the flexibility for connecting up to three independent display interfaces. One USB 3.0 port ensures fast data transmission with low-power consumption. One 5 Gb/s PCI Express 2.0 lane is used as a full-size mini-PCIe (supporting mSATA) and one M.2 (Key E) socket supporting type 2230 for Wi-Fi / Bluetooth module. Single Intel® I210IT Gigabit Ethernet controller provides Gigabit Ethernet LAN access via a RJ45 port. At Portwell, we strive for excellence and the PICO-6260 is merely one example of the multitude of superior products designed and manufactured at our facilities. We challenge ourselves constantly to understand our customers' unique business needs and are committed to meeting their demands. The PICO-6260 is a palm-sized fanless pico-ITX motherboard built with the latest 14 nm Intel® Pentium® or Celeron® processor (codename: Apollo Lake SoC). Support for two USB3.0 ports ensures fast data transmission with low-power consumption and support two com port to allow quick and flexible system expansions. Intel® I211AT Gigabit Ethernet controllers provide dual Gigabit Ethernet LAN access via the one RJ45 ports. PICO-6260 can design their own unique systems for Panel PC, Kiosk and Digital Signage applications.